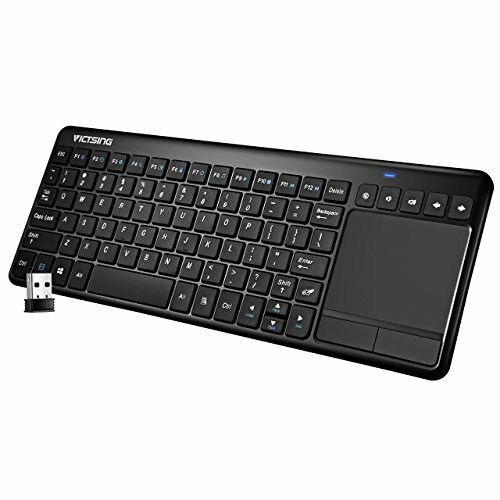 This wireless touchpad keyboard is an ideal combo. Bid farewell to the trouble of multi-device operation, you can sit on the couch and browse the web comfortably with just two fingers. The keyboard will enter shallow sleep mode after being idle for 90 seconds, you can wake it up by clicking or touching. After being idle for 15 minutes, it will enter deep sleep, you can wake it up by clicking. Durable and wear-resistant keys' lifespan is up to 5 million times. It features responsive clicks and can ensure long-lasting use. With 2.4G wireless technology, there is no messy cables anymore, providing a hassle-free wireless experience. Compatible with Windows PCs & laptops (10 / 8.1 / 8 / RT 8.1 / RT /7/Vista/XP/2000), Mac OS X v10.7-10.10（multimedia keys are not supported）, Google Android TV, Android Smart TV, gaming devices, tablets, HTPC, etc. In Android Smart TV, functions of combination shortcut keys from F1 to F7 are not available. All-in-one Design-Bid farewell to the mouse. This keyboard comes with a trackpad, which supports effortless multi-touch navigation for easier web browsing. You can sit comfortably on the couch to control your device. But the scrollbar moves horizontally is only available for the software supporting it, such as WEB, Office, etc. Convenient Multimedia Shortcuts-12 combinations of multimedia shortcuts and 5 media hotkeys provide one-touch access to your content like homepage, data encryption, media player, etc. Make the operation more efficient and reduce the fatigue of frequent operations. Shortcut Keys for Windows 10-Specifically designed for Windows 10 system, the four keys: F2, F3, F5, F7 with the Fn key can instantly access to application switching, windows setting, operation center and the Share option. It can effectively save your time of operation. Space-saving and Fully Functional-Ultra-thin and lightweight, it's portable and convenient for you to carry around and use it anywhere. Come with 87 keys and a touchpad, full-featured, compact and space-saving. Designed with frosted keycap and rubber support, which ensures fashion and stability. If you have any questions about this product by VicTsing, contact us by completing and submitting the form below. If you are looking for a specif part number, please include it with your message.